The Baptism of Jesus is one of the clearest Biblical pictures of the Trinity: Jesus was baptized, God the Father spoke and the Holy Spirit descended. All three Persons present and interacting; all One God. From our Bible-based study of the Trinity, we have established so far that all three members of the Trinity are God and all three are Persons. Having said that, how do these persons exist? This was one of the early and most important challenges for the early church to figure out because, in part because the church came from both strict Jews who believed in ONE God and pagans who believed in many gods. How were they to understand Jesus? For the first almost 500 years the church worked to clarify this truth. They did this in large measure through various church councils and the resulting creeds that came from them. This week we will look briefly at church history to understand their thought processes and ultimate decisions. In the church today we stand on the foundation of careful study of wise Biblical scholars of the past and I hope this brief view of them will inspire you to study the church councils in more detail. Last week we started our study of the Trinity and we could see from the Bible passages that God the Father is God, God the Son is God, and God the Holy Spirit is God. All of them in the Bible are described with the attributes of God. This week the lesson looks at what it means that each one is a Person. We also briefly look at the false Mormon interpretation of the Holy Spirit (who they describe as different from the Holy Ghost). Click on the large image below to see the PowerPoint slides full size and click on the other image to download notes. In a recent television interview, Pastor Rick Warren was asked his opinion about the Mormon Church and he graciously replied that he had a problem with their view of the Trinity, that it was not the Biblical view. I appreciated that because it cut to the core of the difference between the Mormon Church and the Biblical Christian Church–what God do we believe in? 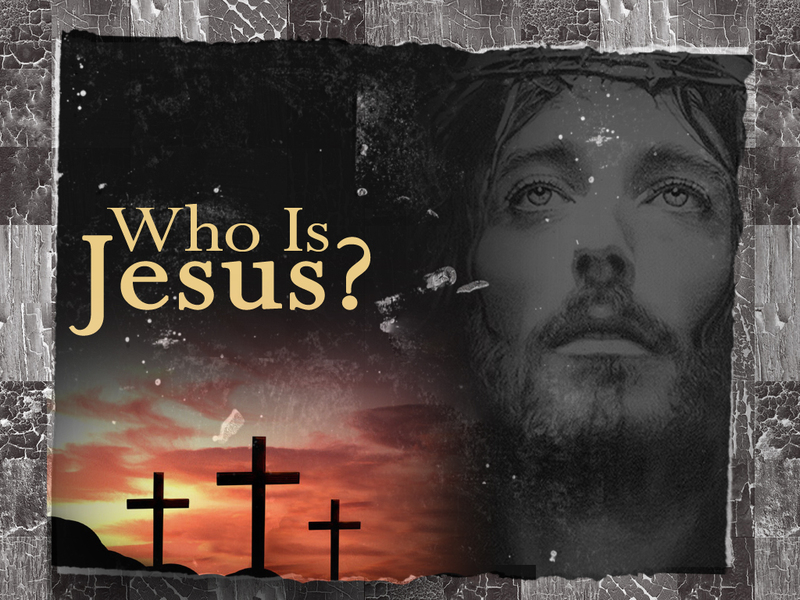 In this and the next several lessons we will look at this in detail as we study the Christian doctrine of the Trinity. God does not reveal things to us in the Bible to confuse us–He wants us to understand the Trinity. It is the foundational teaching about our God and where Biblical Christians different fundamentally with other religions and cults. In this lesson we start by a review of “Progressive Revelation” how God reveals many truths to us progressively through the Bible. We also look at “explicit” and “implicit” truth to answer the questions as to why the word “trinity” is not in the Bible, but is still a Biblical truth. If you want to see the PowerPoint slides full size, click on that image. To download the notes, click on the second image. 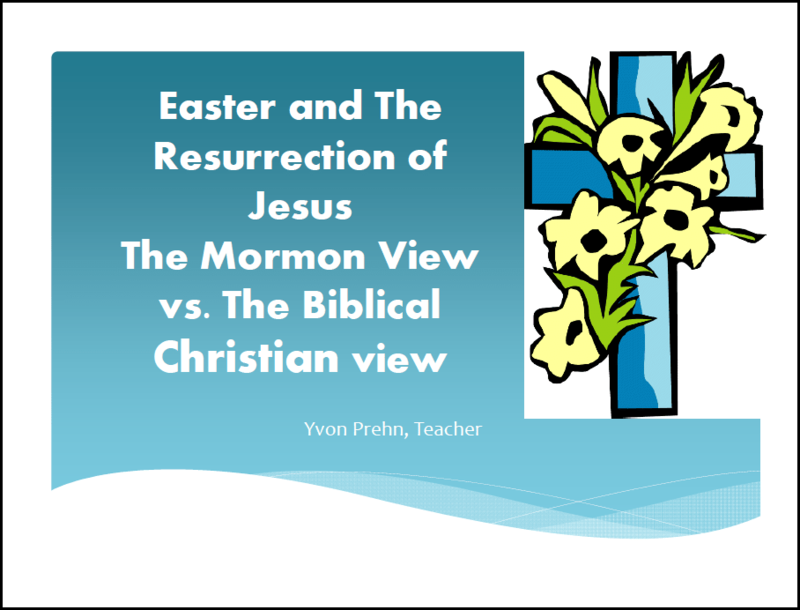 The Mormon Church celebrates the resurrection and therefore Easter, but their celebration of it has a totally different meaning to them than it does to Biblical Christians. They can say they believe in Jesus and the resurrection and that he died for people and rose, but they put totally different meanings into all these terms. In reality, the Mormon Church believes that the resurrection of Jesus assures everyone will have eternal life. They believe Christ’s atonement erased the consequences of original sin for everyone. However, it is only through the Mormon Church that people can travel the path of exaltation and where men can someday become gods of their own world. The lessons that follow show the Mormon views of the Atonement and of the Resurrection of Jesus. Thought the same words are used and though both affirm these events happened, the meaning put into the words and events is very different as the lessons that follow explain. These distinctions are not minor disagreements about theological issues, but they define the meaning of the death of Jesus and the reality of eternal life for those who trust the real Jesus or eternal disappointment for those who trust a false Jesus and a false interpretation of his death. Easter is coming and Christians recognize this as the central event of their faith. It is also a key area where, though the same words are used, Mormons and Biblical Christians mean two very different things. This week we started on our study of it when we talked about the Mormon view of original sin and the Fall vs. the Christian view. The handouts and the full-size slides are below. Just click on either image to download them. Recently on CNN, the pastor of a large church in S. Carolina was asked about the possibility of a Mormon president and he replied that he thought the situation was like when John Kennedy, a Catholic was running for office. In effect he was equating Catholicism with the Mormon church and implying that both are different from evangelical Christianity, but that the Mormon church different in a similar way just like the Catholic Church is different from evangelical Christianity. I am sure this statement, and ones similar to it, that equate the Catholic Church and the Mormon church, as simply different from evangelical churches, but all part of the same overall Christian family that will be made in various ways over the coming months. It sounds so rational and non-offensive, however, it is totally, categorically untrue. It is very important that you understand the difference between the Catholic Church and the Mormon Church. We will be studying these differences in detail in the coming months in our Live Life by the Book class; the following is a brief overview of the issue of the Catholic and Mormon churches. The Mormon Church, though it uses Christian terminology, is not a Christian religion. It worships a different Jesus, it has a different view of sin, of the Bible, of what constitutes Scripture, of the Trinity, of judgment and the final end of man than what has been held by the historic Christian faith. The historic Christian faith, as some Protestants seem to forget, was reformed, not changed, during the Reformation. For almost sixteen centuries, the Catholic Church, kept intact the core of the Christian faith. The protesting reformers removed some of the barnacles that had attached themselves to the ship of faith, but on the basic tenants of the faith: that the Bible is the Word of God; that the Trinity consists of eternally existing Father, Son, and Holy Spirit, that Jesus is the fully God and Fully Man Savior, that Satan is a created being, a fallen angel, that the end of man is judgment based on his or her relationship to Jesus, that humanity, though redeemed and given eternal life in Jesus, will always be subject to God and never become a god, in these and many other areas of doctrine all Protestants and Catholics stand on one side of faith and doctrine and Mormons totally differ. Mormons believe that Jesus and Satan are spirit brothers, that Jesus death made salvation possible for everyone, but that belief in the tenants of the Mormon church are essential for the highest exhalation in the afterlife and that like the god of this earth (Adam, Jehovah or whoever, it varies in their teaching) was once a man such as men today and that any man (not generic humanity, specifically males only) will progress in exhalation to become god of his own world if he follows specific Mormon doctrines and practices. They believe the Bible was distorted and that their books, including the Book of Mormon, Doctrine and Covenants, and the Pearl of Great Price along with the continuing teachings of their church leaders are the true revelations of God. These books contain can easily be shown to be inaccurate historically and factually—for example, the Book of Mormon tells the supposed history of the American Indians as descendants of ancient Israel. In the Book of Mormon Jesus went and preached to these people. 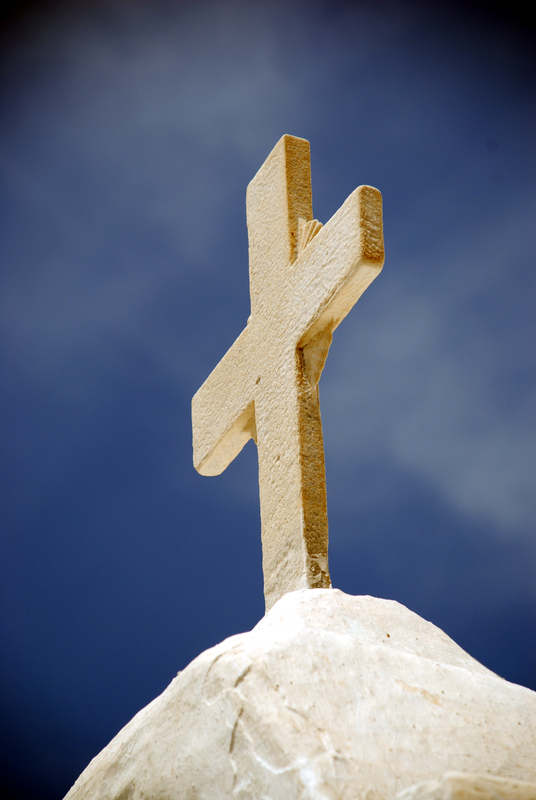 Though styles of worship may vary, the Catholic and Protestant churches worship the Jesus of the Bible. The Mormon Church does not. This is a foundational truth we cannot vacillate on. We want to be kind and gracious in our conversation, but we cannot deny our Lord. We must be clear on this, not for political reasons or to win an argument, but with the humble prayer that those who are deceived might learn about the only and true Jesus who is our savior. There will be many opportunities to learn more about these issues in the coming months and our Live Life by the Book Class will help equip you to discuss them wisely.